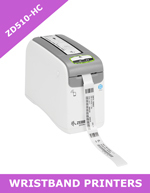 Zebra wristband printers make it exceptionally easy to print individual wristbands on demand. Drop in the wristband cartridge and start printing high-quality wristbands. The speed, quality and ease of use makes them excellent for healthcare, hospitality and entertainment industries. The ZD510-HC has been designed with healthcare in mind - the disinfectant ready plastics can withstand common hospital cleaning chemicals. In the healthcare sector, mistaken patient identification results in dangerous and costly medical errors – patient identification errors lead to 13% of all surgical mistakes and 67% of transfusion mix-ups. Wristbands help to prevent these life-threatening errors and ensure that the right patient receives the right tests, diagnosis and surgical procedures. However, not all wristband printing solutions are equal. Barcodes can often smear or fade and wristbands can be uncomfortable for the wearer, causing them to remove them. This is why the ZD510-HC has been launched. 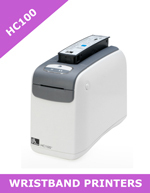 As the industry’s easiest-to-use wristband printer, the machine is easy to clean and sanitize, easy to deploy and manage and ADT (admission, discharge, and transfer) compatible. It also has a comprehensive number of connectivity options and is the easiest loading in the world – just pop in the wristband cartridge and you’re ready to go. The cartridges are compatible with both ZD510-HC and HC100 printers, meaning that HC100 customers can use their existing inventory. This means that you’re also able to use your existing applications and wristband formats, allowing minimal disruption to your operations. Purpose built to meet the unique needs of healthcare users and environments the disinfectant-ready plastics can withstand common hospital cleaning chemicals. However, these durable and high-quality wristbands also have a number of alternative uses from school trips to sporting events and night clubs.